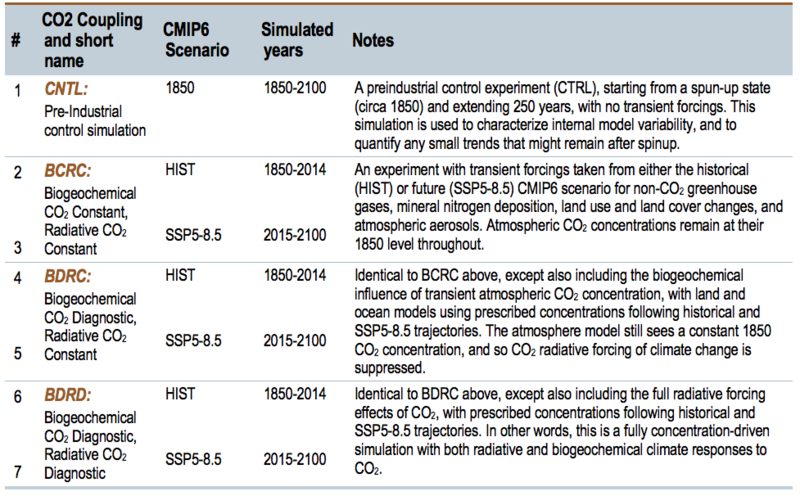 E3SM v1 biogeochemistry experiment: Planned simulations. 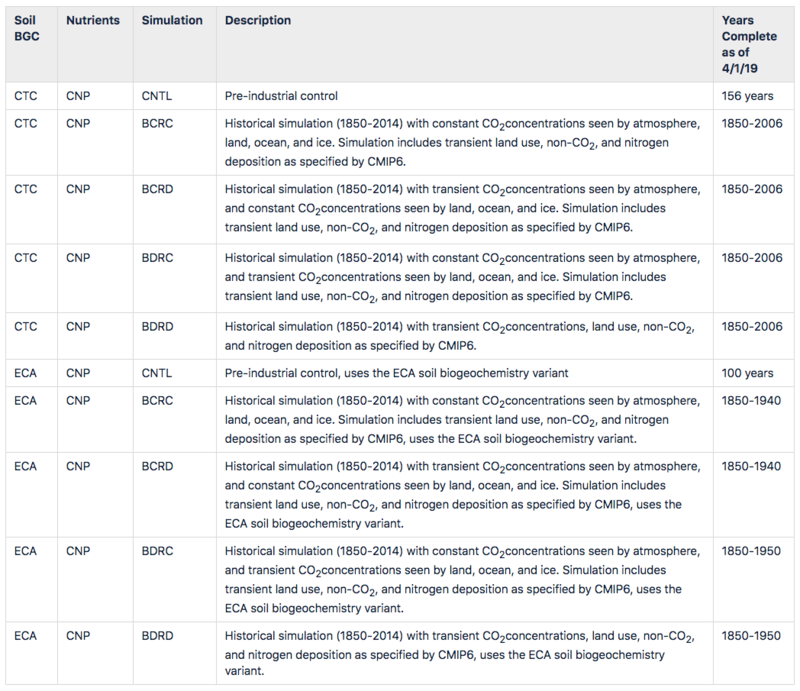 The biogeochemical (BGC) simulations use the lower/standard resolution configuration (100 km atmosphere/land, 30-60-~30 km equator-midlatitudes-poles ocean/sea-ice). The campaign will exercise two different land soil BGC approaches, the Convergent Tropic Cascade (CTC) and the Equilibrium Chemistry Approximation (ECA) configurations, and the simulation campaign will characterize the impacts of the structural uncertainties associated with these different approaches on the model’s coupled carbon-climate feedbacks. Starting from a spun-up physical state, the representations of biogeochemical processes in land and ocean have been turned on, and the coupled model has been spun up to produce consistent initial conditions for the physical state and nutrient pools. Additional simulations are planned to characterize the effect of turning off phosphorus limitation (CTC-CN), and to exercise the model in an emission-forced prognostic CO2 mode (EF). Up till the end of the year 2018, the spin-up simulations for the CTC model configuration were finished and production simulations for CTC runs started with overall 1130 years of simulations completed. In the first quarter of 2019, the ECA configuration spin-up was finished and an additional 1039 years of production simulations were performed (559 additional years of CTC simulations and 480 years of ECA simulations). 10 model runs are currently in progress (see Table below for details for). The compsets for the future simulations is close to being finalized and the progress was made on the CTC-CN spin-up.